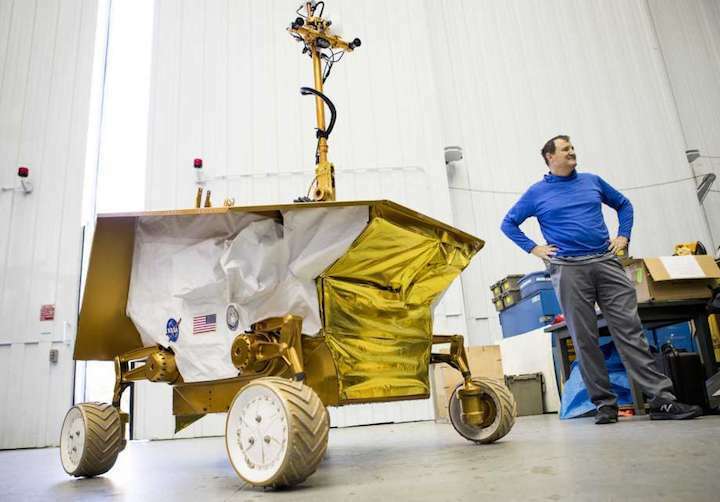 Bill Bluethmann, a NASA robotics engineer at Johnson Space Center, talks about the Resource Prospector rover, designed to drill into the moon's crust in search of water. Even as President Donald Trump signed a directive last Monday to put boots back on the moon, a team of NASA researchers continued work on a quiet project to send an unmanned rover there. The project started three years ago, when several NASA centers, including Johnson Space Center, embarked on a quest to learn more about availability of water on the moon. If there is enough water that can be collected easily, the elements could be broken down to create rocket fuel, for example, or astronaut life support. The result of their efforts, thus far, is Resource Prospector: a 6-square-foot rover outfitted with a drill and mini science lab built to find and process water on the moon. "Our mission is about taking the next step toward chasing the water" on the moon, said Bill Bluethmann, the rover's element lead at Johnson Space Center. In November 2009, NASA officials made an announcement that fundamentally changed how people viewed the moon: Water existed in a permanently shadowed lunar crater. Many in the scientific community assumed the moon was a dry, desolate place. But data from NASA's Lunar Crater Observation and Sensing Satellite indicated otherwise. "Up until that point, everyone was certain the moon was absolutely dry, and this flipped that on its head," said Dan Andrews, project manager for rover at NASA's Ames Research Center in California. This discovery "really was a game-changer for how we thought of the moon." Scientists began chasing this new discovery in earnest. About five years later, NASA researchers began developing a rover that could find and capture this water. Their budget is $250 million — a small-scale project, Bluethmann said. Fast forward to 2017 and the rover still is in the technology development phase. But researchers have a sense of how it will work. Using mapping technology, the rover will determine the areas of the moon saturated with the most hydrogen. It is those areas where the rover will drill for water in 4-inch chunks, Bluethmann said, going down as far as a meter. Soil samples will be brought inside the rover any time water — typically in the form of ice — is detected, he said, and machinery that will test the soil. The soil will be weighed and heated, he added, and anything that comes off the sample will be captured. Scientists want to understand "whether (the water) is on the surface so we get to it, whether we have to excavate to get it ... whether it's distributed as nice bricks or channels," Bluethmann said. The discoveries made during this mission, slated for 2022 or 2023, could have serious ramifications for deep-space travel, he said. If enough water is found, the hydrogen could be used to refuel rockets on the way to Mars, for example, and the oxygen could be used to refuel life support for astronauts, he added. This would not only make deep-space travel easier, it would make it cheaper. "Launching 1 pound of any material into space costs thousands of dollars," NASA's website states. "One gallon of water weighs more than 8 pounds, so the ability to generate water, air and fuel in space could represent enormous cost savings for future deep-space missions." The possibilities, Andrews said, have gained the attention of many commercial manufacturers. "Really, I think the commercial world is hinging on what (Resource Prospector) finds about the nature of lunar resources," Andrews said. "If they are accessible and if clever folks can come up with methods to extract them that are financially viable, that could be a new market." The rover is being built to last a full lunar day: about two weeks on Earth. It will stay on the moon, along with its samples, when the mission is complete, Bluethmann said. Johnson's moon rover could gain traction under the Trump administration, which has expressed a renewed interest in human lunar exploration. That interest was cemented Dec. 11 when Trump signed Space Policy Directive 1, urging NASA to return Americans to the moon. The directive "marks an important step in returning American astronauts to the moon for the first time since 1972 for long-term exploration and use," Trump said. The Trump administration has been working its way up to this announcement all year. Vice President Mike Pence voiced an interest in returning to the moon in October during the National Space Council, according to the New York Times. The council, created to coordinate policies between NASA and other agencies involved in space, was dissolved in 1993. But Trump this past summer re-established it through executive order. "We will return American astronauts to the moon, not only to leave behind footprints and flags, but to build the foundation we need to send Americans to Mars and beyond," Pence said, according to the Times. On the day of Trump's December announcement, officials with Johnson Space Center said it was too early to "understand how implementation of the new directive may affect our work." The center will undoubtedly be impacted: Johnson is where astronauts live and train before embarking on any space missions. The move to return to lunar exploration comes after the Obama administration spent eight years pushing Mars travel over the moon. It's not clear how or when a lunar exploration endeavor will be executed by the current administration. Funding for the directive was not addressed during the Dec. 11 presidential announcement. Though Andrews, the lunar rover project manager, did not directly comment on the Trump administration's renewed interest in the moon, he said NASA's focus on both lunar and deep-space missions will be helpful to their mission. "I don't even think you have to be interested in the moon to see the value of Resource Prospector," he said. Its findings "could enable so many other destinations as well."